If there has been one game-changer in the contact/call center over the last decade, it has been social media. It is at once both an excellent channel for real-time communication between you and your customers as well as a powerful platform to spread your message. Every year, the most popular social media channels only become more popular and more integrated into our everyday lives. With popularity comes opportunity. Below, we included our infographic detailing some of the cold hard numbers around social media. In light of these statistics, it is clear: social media is an essential part of the modern customer experience. Every business should seize this opportunity to take advantage of it. With almost half the world’s population on social media, businesses have the chance to reach more people more easily than ever before. By targeting or micro targeting your audience, establishing real connections with real people, and delivering personalized service to your customers, social media can truly enhance your customer experience. One of the biggest hardships with managing a social media presence is the division of labor. What responsibilities are held by the marketing department? Which fall under the umbrella of the contact/call center? Instead of drawing a hard line between these two teams, we encourage collaboration. 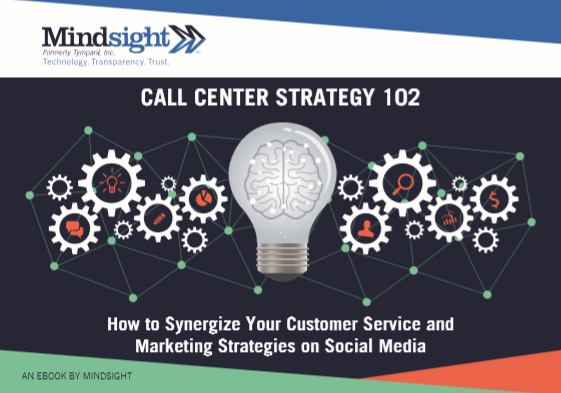 Download Mindsight’s ebook, Call Center Strategy 102, and learn how these two departments can work together to create a more impactful social strategy. Best Practices For Customer Service On Social Media.